BURBANK, Calif. (May 18, 2017) – As Lightning McQueen heads to the big screen alongside his new tech-savvy trainer Cruz Ramirez, Disney•Pixar’s “Cars 3” fuels two soundtrack releases—both available from Walt Disney Records on June 16 as the film opens in theaters nationwide. The Cars 3 Original Motion Picture Soundtrack, features eight tracks—including original songs by Dan Auerbach and ZZ Ward, four covers by various artists, and two instrumental tracks from Brad Paisley. The Cars 3 Original Score Composed and Conducted by Randy Newman reunites the “Cars” franchise with the Oscar®-winning composer. Both soundtracks are available for pre-order tomorrow, May 19, 2017. Auerbach will release Waiting on a Song, his second solo album, on June 2 via his new label, Easy Eye Sound. The soundtrack also features “Ride,” an original end-credit song performed by Hollywood Records artist ZZ Ward, featuring musician Gary Clark Jr. Written by Ward, Evan Bogart and Dave Bassett, the song was released by Walt Disney Records as a digital single on April 14. It was performed live by Ward April 17 on ABC’s “Dancing with the Stars.” Ward’s sophomore album, The Storm, will be released June 30. “Kings Highway,” originally released in 1991 by Tom Petty and the Heartbreakers, makes a comeback courtesy of 23-year-old British singer-songwriter James Bay. Bruce Springsteen’s 1984 hit “Glory Days” gets a modern-day makeover by Grammy®-nominated performer Andra Day, who voices Sweet Tea in the film—a performer in the Cotter Pin with a hairstyle reminiscent of Day’s signature look. The Beatles’ classic 1965 song “Drive My Car” is back on the road, compliments of Hollywood Records artist Jorge Blanco. 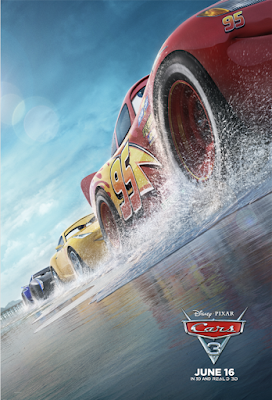 From Walt Disney Records, the Cars 3 Original Motion Picture Soundtrack is available June 16 and can be pre-ordered digitally HERE and via Amazon HERE. Newman used a 110-piece orchestra to record the score. The Cars 3 Original Score Composed and Conducted by Randy Newman is available June 16 from Walt Disney Records and can be pre-ordered HERE. **Links may be available until the pre-sale goes live on 05/19/17, so please visit again. Don't forget to mark your calendar for Disney•Pixar Cars 3, coming to theaters this Summer! If you like this content, and would like to keep up-to-date with the latest in fun family films, just like this one, be sure to follow us through your favorite social media venue. You can find us through the buttons on the right sidebar. You can also subscribe via email, and get the latest at the comfort of your own inbox. Can't wait for this movie? Please let us know in a comment below, who are you going to watch this movie with, and which is your favorite character: We would love to know. Until next time, remember to smile, because it's free and contagious!